Why choose truck mounted carpet cleaning in Marysville,Wa. When it comes to carpet cleaning and carpet cleaners, you have many choices. There are literally hundreds of different carpet cleaners competing for your business in even the smallest cities. There could be thousands of them in the larger ones. Each one of them will tell you that their method of cleaning is the best and that you should choose them. If you are not inside the industry, you might not be able to tell who to believe. I am hear to tell you though that the best method is truck mounted steam cleaning and this article will tell you why. There are many benefits to truck mounted machines but one of the first that comes to mind is that they heat the water to a higher temperature. They can heat the water to well in excess of 190 degrees. This extra heat is useful for a number of reasons. It allows the cleaner to use less chemical and it makes the chemical work better. Heat acts like a catalyst and the more you have, the better a cleaner will work. It also helps to improve the drying time because hot water, will of course, evaporate faster. 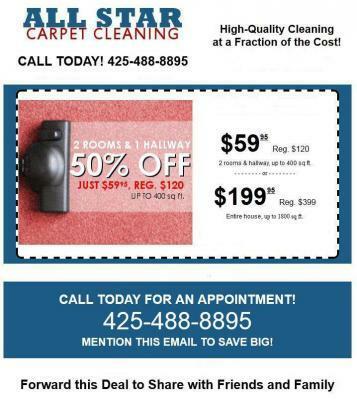 This can cut hours off of the drying time of your carpet in Marysville,Wa. Another benefit to truck mounts is that they produce more vacuum. They are powered by gas engines and no portable machine powered by electricity could create as much suction. What this does is allow the carpet cleaner to extract more water. in Marysvill,Wa. This will make the carpet dry faster but will also allow them to use more water. This will remove more soil. Portable systems are limited in the amount of water that they can use because of the poor vacuum. Lastly, these systems are better than portable systems because they allow for all of the equipment to be left in the carpet cleaning van. All that your carpet cleaner has to bring into your home are a couple of hoses. All of the noisy and smelly parts remain outside. And, because the equipment is outside, it is not releasing humid air into your home. This leads to, you guessed it, a faster drying carpet. Not all carpet cleaners will use truck mounted systems because of the expense and operating costs that come with them. Those that do have made a commitment to quality which is why you should only choose owner operated carpet cleaning services.